GROUND ZERO PLUS 1253 DAY--New York, NY, Monday, February 14, 2005--Myth has it that in the third century Roman Emperor Claudius II created Valentine's Day by trying to Terrorize love. The legend has it that Claudius believed that married men made terrible soldiers because their first priority was thinking about their wives and families. Instead of fighting a hundred percent for the Emperor, these love-sick family men hedged and often were more concerned with living to defend their families than sacrificing themselves on some foreign battlefield. He became the "Beast of Love Terror." 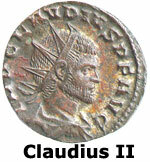 Catholic priest Valentine took issue with Emperor Claudius' edict and despite the danger of physical torture and death, married young couples despite the ban. 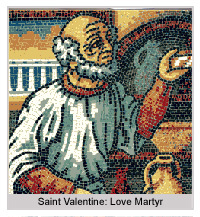 There are other myths and legends about Saint Valentine, including one where he fell in love with the jailor's daughter and sent her a love note signed, "Your Valentine." The only known fact is that February 14 is Saint Valentine's Day, and, it has been linked to an expression of love. On the same note, Valentine's Day can also be considered a form of Vigilance Day. If love involves the protection and preservation of one's family--as was the case when Emperor Claudius banned marriage--then he was worried that being a Sentinel of Family Vigilance would trump being a Sentinel of Emperor Vigilance. The role of being a family protector, guarding it against all forms of "beasts," has been a primary role of men since the dawn of time. This includes the animal kingdom as well as the human one. Today, guard dogs symbolize the relationship between the family and its need to ward off potential danger. 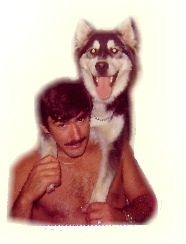 In my own case, when I was traveling all over the world in an earlier career, I had two Siberian Huskies at home--Zonka and Volka. I felt secure knowing my wife and children had two wolf-related canines patrolling the house and that they had nice long fangs that would, without hesitation, sink into the flesh of anyone trying to penetrate the home's perimeter. Living in New York City, the predominant Sentinel of Canine Vigilance on the streets is the Pit Bull. While not a friendly dog by any means, it will protect its owner with a viciousness that keeps "Beasts of Terror" at bay. Vigilance is about protecting. The core of that Vigilance is the power of love. 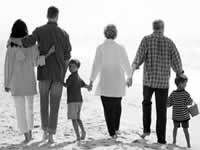 If one truly loves his or her family, then one's life is secondary to the safety of the family. This means that a Sentinel of Valentine Vigilance is not afraid to face the greatest of all demons that exist--Fear, Intimidation and Complacency. Emotional Terrorism is far more frightening to many than physical, for it involves the exposure of one's inner vulnerabilities. A true Parent of Valentine Vigilance is not afraid to share with his or her children that understanding one's Fears, Intimidations and Complacencies is the key to driving away the threat of the Beast of Terror. When the Beast of Emotional Terror realizes that a child has a Sentinel of Valentine Vigilance who will stand between the child and the beast and bare his or her fangs even at the risk of his or her own injury, the Beast will run and seek out a far more easy prey. A child who learns that his or her parents or loved ones are not afraid to be afraid and admit that Fear, and not reticent about conjuring up at least One Percent more Courage to overpower that Fear, the child sees a model of how to counter the ominous shadow of the Beast of Emotional Terror. So, on Valentine's Day we have one more opportunity to vow our Pledge of Vigilance to our loved ones. We have one more reason to turn away from the "emperor" and fight for our family rather than all the other meaningless factors that try to rob our attention from their security. Be a Sentinel of Valentine Vigilance. 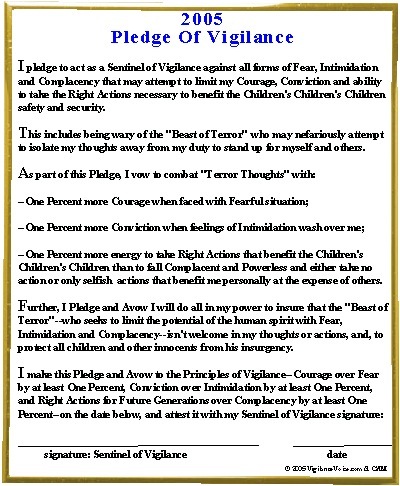 Take the Pledge of Vigilance today as your great Valentine gift to those you love. Go To Yesterday's Story: "Unfurling The Gates Of Vigilance"